I name Lavender the plant of the week, it does not matter what the variety of lavender that we display or sell at the West Roxbury, Ma. Home Depot garden center, lavender is always a crowd pleaser. This past weekend we had a customer buy an entire rack of Hidcote English Lavender! The beautiful lush plants grew up and out of glorious square pots that are suitable for displaying and growing the beautiful fragrant Lavender plants right in; but this particular customer is going to create a short hedge of Lavender along her walkway, and she requested eight more plants! Never mind being a fly on the wall, I wish I was a bee in her garden! Not only is Lavender “Plant of the Week” it is also “Trending in the Aisle”! The carload of lavender…. and yes, all the seats and the floor of the car was brimming with lavender; the sight caused such a stir everyone wanted some! Our friends at The Plant Group, our premium perennial provider, quickly filled our request for more and we are full of lavender once more! If you do not have lavender in your garden or in a pot on porch or step or in a bright sunny window within your home, treat yourself!!! You will quickly discover what all the fuss is about! Lavender is easy to grow in the garden, it essentially thrives on neglect it loves a well-drained location with not the best soil, it enjoys being planted by a walkway or amongst stone because it benefits from a lime based, sweet alkaline soil. Just clip it back after blooming or while it is blooming and save the heads for sachets or dried flower arrangements or just in a bunched by themselves makes a simply beautiful statement. There is nothing complex about the beauty of lavender, it has an ahhhh factor all its own, I watched it happen on Saturday, the plant draws people in all by itself, but by the car load….what an impact! 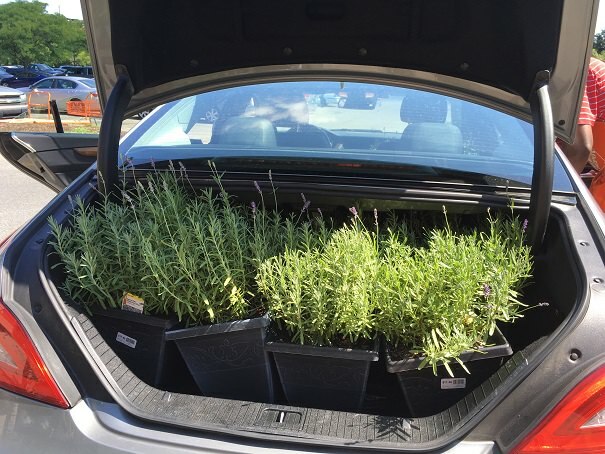 Stop by your local Home Depot garden department ask for a Lavender plant, you deserve one, or two or a whole carload….or just breath it in!